Product prices and availability are accurate as of 2019-04-12 00:11:17 EDT and are subject to change. Any price and availability information displayed on http://www.amazon.com/ at the time of purchase will apply to the purchase of this product. 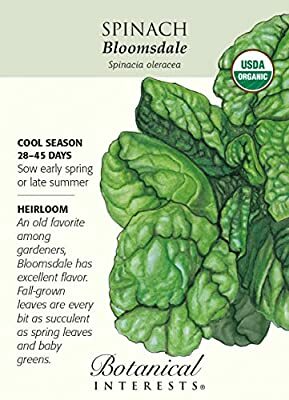 This heirloom spinach is an old favorite among gardeners. It has very dark green glossy savoy-type curled leaves. Bloomsdale also has excellent flavor, is bolt resistant, and is easy to grow. Spinach is a nutritional powerhouse that is delicious fresh or steamed! In the 1930's, the spinach industry credited the cartoon character Popeye for a 33% increase in national spinach consumption. Today, we don't need a beefy sailor to sell us on its benefits! A low calorie nutritional powerhouse, spinach is loaded with Vitamin A, Vitamin C, Folate, Iron, Calcium, antioxidants, fiber, and many other nutrients. We love to eat it steamed with nutmeg or raw in salads, but you can also eat it sauteed with pastas, omelettes, and in dozens of other dishes. Its uses in the kitchen are nearly limitless!